How much longer will Electronic Arts make Android fans wait? Earlier today, we caught wind of an interesting stat. According to this article, Android currently holds a whopping 75 percent of the smartphone market, with Apple trailing at just 14.9 percent. Math was never our strongest suit, but based on those numbers, Electronic Arts needs to release The Simpsons: Tapped Out on Android. In case you haven't heard of the game, Tapped Out is a free-to-play iPhone and iPad title that lets players rebuild the fictional city of Springfield from the ground up with help from the show's iconic characters, including Homer, Marge, Bart and Lisa. What makes it so much cooler than the competition is the unmatched presentation that brings not only the show's writers, but also voice actors into the fold. When you tap Ned Flanders, the pesky next-door neighbor sounds like Ned Flanders, and the same holds true for everyone. On that note, the game's been a huge success, and with an untold number of Android users eager to get Tapped Out, it makes perfect sense for EA to bring one of its biggest hits to the dominant platform, as it has done with previously released mobile and tablet games, like Mass Effect Infiltrator, Dead Space and, more recently, Need For Speed: Most Wanted. Granted, The Simpsons' road to the top has been bumpy, to say the least. The initial launch, which took place earlier this year, was plagued with bugs, forcing EA to remove the app entirely. Even today, the updated version takes quite a while to connect, and this is with a much smaller group of people. On Android, there's a good chance the game would suffer. This doesn't mean, however, that EA shouldn't move forward. 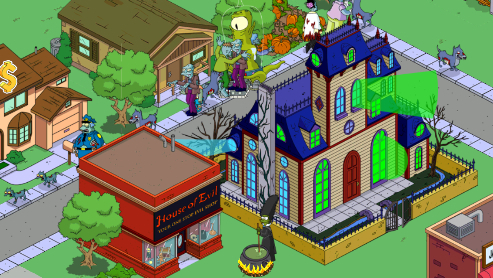 Google "The Simpsons: Tapped Out Android", and you'll find plenty of disgruntled Android owners begging the company to port the freemium effort to their preferred platform, and they'll only get louder if EA runs promotions alongside the show, as it did with the previous Treehouse of Horror. On that note, we'd love to see The Simpsons: Tapped Out come to Android sooner than later. Message to EA: Less "doh", and more "woo-hoo".